Look below for Jamestown Settlement & Yorktown Victory Center ticket deals for local residents! What's so special about this site? Remember the saying "Don't judge a man 'til you've walked a mile in his moccasins?" If living like someone helps you understand them better, then walking around this living history attraction is like really being a colonist for a day. ore than anywhere, it helps you visualize what life must have been like for John Smith, Pocahontas, and John Rolfe. And it's not what Disney taught us. One fact we learned during the tour a few years ago still shocks us to this day (more on that in a minute). The indoor exhibits set the stage. Start off with an introductory film on the colony's beginnings. Then walk through halls featuring dioramas of what American Indian camps would have looked like before the colonists arrived. (Dioramas are recreated scenes--life-sized or miniature-- of hiistorical scenes. Afterwards, you can visit an English street scene, and view exhibits on tobacco and other crops so crucial to the colonists' lives. Outside you can walk through a recreated Powhatan Indian Village. You can see how many people fit inside a wigwam. Talk with costumed soldiers, American Indians, and mob-capped ladies (they call them "costumed interpreters") who'll show you how to do daily chores like grind corn. They may even teach you a little dance. A short distance is away is what many kids enjoy most: a recreation of the wooden stockade built by the colonists when they arrived. In between defending the fort against attackers, kids can try on armor, play colonial games, and watch blacksmiths and carpenters do their work. 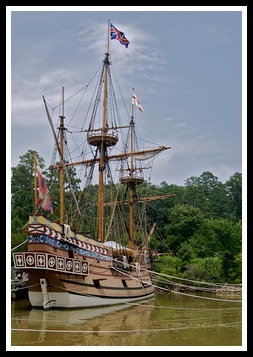 Climb aboard replicas of the ships the colonists sailed on to the New World..the Susan Constant, the Godspeed, and the Discovery. Years of watching pirate and swashbuckling movies can't prepare you for the true size of these boats. They're TINY! Far smaller than you'd imagine after seeing spacious cabins in the movies. Conditions must have been unbelievably cramped, cold and smelly. (They would have been even worse on slave ships a century later.) It makes you realize what a huge (and dangerous) step it was for the early settlers to come here. If you have the time, we recommend that you buy a Combination Ticket (see below). Plan a full day and visit Jamestown Settlement in the morning, have lunch at Pierce's BBQ in Williamsburg, then spend the afternoon at Yorktown Victory Center. Can you do it all in one day? It really depends on what kind of museum-goer you are. Since we have younger kids with a limited attention span, or family can do it in one full day. But if your kids are older, or if you're the type who likes to carefully peruse all the exhibits, and experience each and every activity, you're better off spreading the itinerary out over two days. NEW: "Pocahontas Imagined" Exhibit - This six-month, special exhibition commemorates the 400th anniversary of the death of Pocahontas in 1617 and investigates both the facts and myths surrounding Pocahontas through memorabilia, artifacts, and interactive experiences. They even have a special portion of the exhibit geared to children. Is the Settlement worth the price? It IS more expensive than Historic Jamestowne, but the difference in price between the two is less than it used to be. On the other hand, Jamestown Settlement really brings history alive. Crawling into the cramped hold of a ridiculously small ship, or seeing a costumed "colonist" prep and fire a musket paints a picture no guidebook can describe. Jamestown Settlement is open daily 9 am-5 pm (9 am-6 pm from June 15-August 15). Allow two or more hours to visit. If you're going to Yorktown Victory Center too, buy a Combination Ticket for $23 per adult and $12 per child. (Savings: about $5 per adult and $3 per child.) It gives you one-time admission to each museum and may be used on different days. You can also get a Four-Site Value Pass which offers 7 days of admission to four sites: the Settlement, Historic Jamestowne, Yorktown Battlefield and Victory Center for $37 for adults and $25 for youth ages 13-15, and $14 kids ages 6-12 (it's free for kids 5 and under). History is Fun deal - Buy your Combination Ticket online and you'll get tickets good for 7 consecutive days to visit both sites - unlimited! Buy One Day, Get an Entire Year deal - For a limited time, Virginia residents can buy an American Heritage Pass for $21 for adults and $10.25 per child and get unlimited visits for a year to both sites. Free Admission Deal for Local Residents - You'll get free admission to both historical sites every operating day of the year if you're a resident of James City County, York County and the City of Williamsburg, including the College of William and Mary. Just make sure you bring proof of residency (e.g., a utility bill or driver's license). For all deals and current admission info, go to www.historyisfun.org and go to "Tickets and Packages." Click here for more info on discounts and package deals which may be worth your while. Are you a homeschooler? Take advantage of special homeschool programs, plus reduced admission on these days. You'll pay just $12 for a combo ticket (Jamestown Settlement and Yorktown Victory Center) if purchased at least a week before the event. Click here for info on Homeschool days. Yep, Jamestown Settlement also has a sister museum-- the Yorktown Victory Center, an interpretive attraction that showcases the Revolutionary War and the decisive American victory at Yorktown Battlefield. Just a ten-mile drive down the historic Colonial Parkway from Williamsburg, Jamestown Settlement is also only a 20-minute drive from Yorktown. You can either drive or take the free Historic Triangle Shuttle bus, which provides service between Jamestown, Yorktown, and the Colonial Williamsburg Visitor Center. It runs every 30 minutes 9 am - 3:30 pm, April 1 to Oct. 31. For more pages on Jamestown and nearby attractions, go to my Site Index.